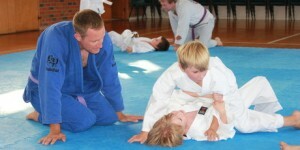 Brazilian Jiu-Jitsu students at the Submission Martial Arts school in Takapuna. Much has been made of the trend for overly protective parents who shelter their children from experiences that might harm them. Whether you agree or disagree with this approach, the fact is that the world does seem a more dangerous place for this generation. There’s help at hand, and all around Auckland, clubs are catering for little warriors, giving them skills that may protect them one day, as well as being a way to let off steam and build self-confidence. A fighting spirit will stand them in good stead to face the modern world. Brazilian jiu-jitsu is a martial art, a combat sport and self-defence system, which looks to me like the ground-fighting many dads and sons do on the living-room floor. Take a closer look and BJJ, as it’s known, is teaching the skill of a smaller, weaker person taking on a much bigger competitor – the perfect wrestling scenario for children. “It takes a couple of years learning BJJ to be able to defend yourself,” says Warren Lambert, who teaches a class in a Takapuna hall on Friday evenings. There’s also an element of discipline, and at the end they delight in saying thank you, clapping and shaking hands, before heading home for the weekend.